Enter Content Here: Who Isn't Working on a SharePoint Killer? I talk to a lot of web content management software vendors and open source project leaders and it seems like most of them are working on some kind of "knowledge worker collaboration portal" - a SharePoint killer. At first they avoid this comparison (nobody likes to openly challenge Microsoft on its home turf; even now in the era of "I'm a PC, I'm a Mac"). But eventually, they admit that is exactly what they are doing. To be honest, I don't blame them. 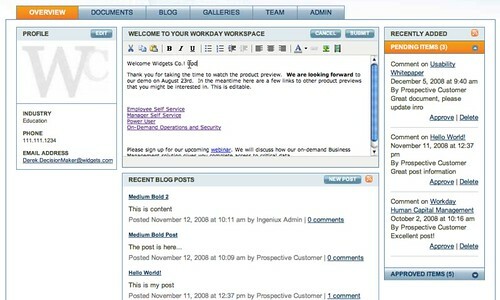 There is something very compelling about building a knowledge worker collaboration portal. Portal technology has been a solution looking for a problem . Knowledge worker information management ("knowledge management") has been a business problem that has confounded technology for ages and only seems to get worse as the sea of unmanaged information grows. A "knowledge sharing portal" is a logical union of solution and problem and the success of SharePoint practically proves it. Who doesn't want a piece of that action? Still, this does not mean that information management problems are on the verge of extinction. Even SharePoint's most ardent advocates concede that companies cannot cleanly codify all of its corporate intelligence with SharePoint alone. That takes governance, discipline, and investment beyond technology. But since implementing technology is always easier than affecting profound organizational change, there will always be a market for tools that promise miraculous results - just as there is always a market for easy weight loss programs and pills. These false promises of quick fixes have kept technology companies in business for years. Even though market demand is huge, competing against SharePoint is not easy. For small to medium size companies and (especially) non-profits, it is hard to beat SharePoint on price. It is also hard to make the case about proprietary technology and lock-in to a potential customer that lives in Microsoft Office (as most knowledge workers do). Right now, alternatives to SharePoint are most attractive to companies that want to avoid building competencies in managing Microsoft servers and .NET development. It is going to take some bigger disruptions to minimize Microsoft's competitive advantage as a collaboration tool for the mass market. The big thing to look out for is a reduced supremacy of Microsoft Office file formats. This could be from an increased adoption of the Open Document format or it could be through a transition to "file-less" server side information storage like wikis or Google Docs. Until that happens, SharePoint killers will have the biggest success with companies that are reducing their use of Microsoft technologies on principle and with very large companies that are punished by Microsoft's per user licensing model. This is still a sizable market but hardly a threat to MOSS's core territory. I can't even count the times that clients have initially used the word "portal" to describe their projects and later find that what they are looking for is just a regular informational website. Not a portal.